Pixel art plus lighting effects equals niiiice. Procedurally generated levels, permadeath, local co-op for half a dozen players, and a smooth running speed of 60 frames per second. Yes, please. The vertically-scrolling platform game TowerClimb from Davioware recently received a big update that adds a lot of new content for beta owners. One of the more notable features is six player local co-op, allowing you and your friends to climb through the extraordinarily dangerous environments together as you do nothing but help each other stay alive. No trolling here, no sir. TowerClimb creates a unique atmosphere of wonder that encourages exploration, even though every move you make could be your last. Fly, jump, swim, wall hang and air jump your way to safety as countless creatures reach out to nab you (or ignore you altogether). Be on the lookout for power-ups that help you stay alive, but don't be frivolous with their use, as you never know what awaits above the fold. 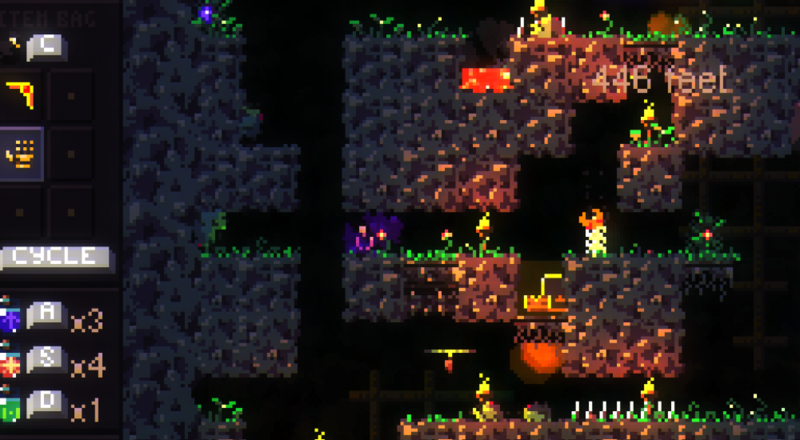 Developer Davioware has been working on TowerClimb since 2010 when the game first appeared in alpha form. The current build creates a surprisingly intense atmosphere, rewarding players who are patient, skillful and cautious. You fall into one dangerous situation after another but must conserve your resources if you want to live to see another screen. The tension is high, but so are the rewards for staying alive. TowerClimb is currently in beta but is available to purchase at a discounted price. Buy it now and you'll get the full game when it's released. It's also up for voting on Greenlight. Page created in 1.5763 seconds.